With two kids and a hubbie I am always trying to find a great recipe that is easy to put together and doesn’t take a lot of time. This 5 Ingredient Pork Chop and Rice Bake was not only easy but it tasted fabulous and was a hit with the family!! I wanted to share it with you because I know you guys are just as busy with the kiddos as I am! If you are in a hurry you can skip this step and just place the pork chops into the oven raw but I like to get a little browning on the edges first. Place a little oil or butter into a skillet and turn on med-high heat. 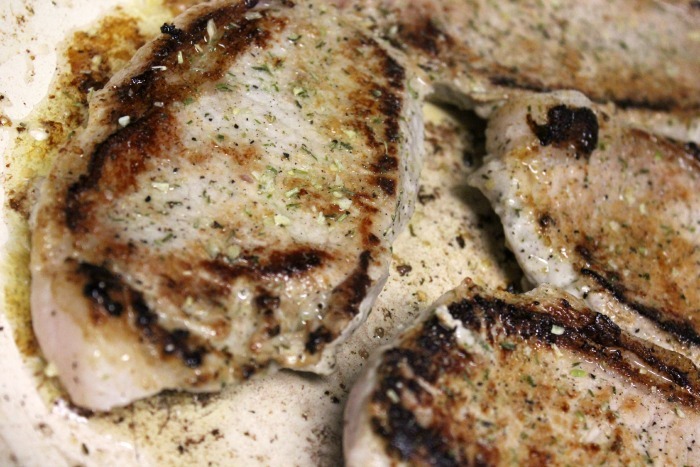 Brown pork chops on both sides. This should only take a few minutes, the pork chops just need to be browned not done all the way through. 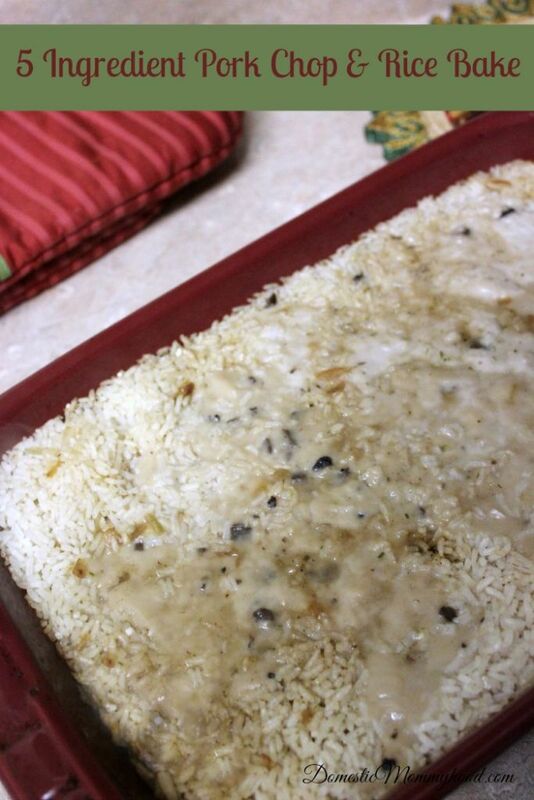 Pour uncooked rice into a greased 9×13 casserole dish. Pour water over rice and stir just a bit with a spoon. 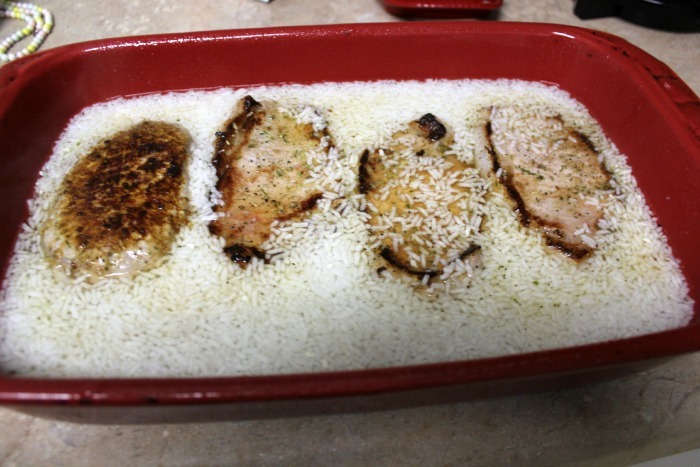 Place pork chops over rice mixture and sprinkle the contents of the packet over the top of rice and the chops. Pour both cans of cream of mushroom soup over the top and cover tightly with aluminum foil. One your oven is up to temp. place casserole into the oven and cook for 1 hour. I took the aluminum foil off after about 45 minutes and bumped it up to 400 degrees to crisp it up just a bit. Let me know what you think about the pork chop and rice bake. We found it tasted great and was so easy to do! The prep time took me about 10 minutes and then cooking of course was around an hour. I wonder if this would work in a crock pot?? If any of you try it please come back and let me know! If you like the Pork Chop and Rice Bake you may also want to try my Homestyle Country Fried Steak with Milk Gravy also. It is downright yummy! You could also finish up your Pork Chop and Rice Bake with a yummy Pretzel Fooler Salad! Mm Mm Good! This looks delicious and easy, perfect for dinner! So glad to find you on the Weekend Retreat!